An electro physicist with the Kyoto University, Japan, Dr Nobuyuki Yamaji observed during his experiments that plants and mammalian tissues secrete a layer of fluid after getting hit by lightning or electric current . The significance of the secretion was unknown to him. Later when he met his friend, Dr. Sunao Kubota, who was a physician and professor of General Surgery in St. Marianna University, he shared his work and Dr. Kubota began analyzing the nature of the secretions. Dr. Kubota hypothesized that the secretion's role may be to provide a temporary barrier to the entry of pathogens through the area of skin dehiscence caused by the electrical damage, until healing process helps to cover the dehiscence. Then for the next decade Yamaji and Kubota worked to isolate the ingredients of the secretion and they together developed a citric acid-based biosimilar capable of killing a wide range of pathogens which are known to cause common as well as severe infections including nosocomial infections such as MRSA, VRE etc  without having to use alcohol-based disinfectants. This biosimilar named as Clinister, had the ability to kill even H5N1 influenza virus and is used in Japan as a spray disinfectant in public places . Clinister has not only been proven as a disinfectant but is also a powerful anti-bacterial and anti-fungal agent that strongly restricts the recurrence of the microbes for a long term. In the present study, Clinister was evaluated for its virostatic efficacy against Chikungunya virus (CHIKV) in vitro for the first time. It showed expressive effect on virus grown in BHK cell cultures by inhibiting the development of virus induced cytopathic effect at an effective concentration of 1.5mg/ml in comparison to 70% ethanol, a common disinfectant. The effects on the virus were further checked by Polymerase Chain Reaction (PCR) at different regular post infective intervals from 0 to 72 hrs. The observations suggested that, other than the anti-microbial activity, Clinister also have specific effect on viruses that may cater the need to prevent the spreading of contagious viruses during epidemics which may occur in the future. However it is essential to study the specific targets of Clinister in viruses at a molecular level, and the same is under progress. A chemical engineer Prof. Yuichi Mori jointly with polymer scientist Dr Hiroshi Yoshioka developed a thermoreversible polymer (TGP) hydrogel composed of thermoresponsive polymer block [poly (Nisopropylacrylamide- co-n-butyl methacrylate) (poly NIPAAm-co-BMA)] and the hydrophilic polymer block [polyethylene glycol (PEG)] (commercial name :Mebiol gel) . This Mebiol gel provides a suitable in vitro environment enabling culture expansion of cells in the lab without the use of biological components such as amniotic membrane or feeder layers. TGP has been earlier employed for the three-dimensional culture of many cell types like corneal limbal stem cells , chondrocytes , embryonic stem cells , hepatocytes , induced pluripotent stem (iPS) cells  and bone marrow mononuclear cells . TGP has been used for transportation of corneal endothelial precursor cells over long distances without cool preservation , for micro-encapsulation of islet cells  and as a wound dressing . TGP has been intralesionally applied along with stem cells in an animal model of spinal cord in injury . TGP is a unique polymer capable of maintaining stem cells in an undifferentiated manner for a longer period of time . It does not affect the gene expression profile  and the karyotype of the cells is maintained even after long term culture . The safety and efficacy of TGP as a valuable scaffold material has been established in the various in vitro and translational studies . Mebiol Gel was used as a 3D scaffold for growing hepatocyte cell line. Mebiol Gel based hepatocytes had better differentiation and the cells were susceptible to hepatitis C virus replication. The Mebiol Gel based 3D culture system can be used as a better cell culture system for viral studies. A novel platform for in vitro culture of HCV having been described, similar platforms for not so easily cultivable viruses can also be developed. The 3D viral culture technology can be exploited to study the replication process and other intricacies of the virus in in vitro culture. When in vitro expansion of viruses in an appropriate manner becomes feasible, anti-viral agents, either virostatic or virucidal, herbal or synthetic biosimilars can be analysed to come out with effective anti viral agents. A biosimilar-based compound having been proven against Chickungunya virus, the same could be tried against life threatening viruses in appropriate and safe environments. Clinister being a food additive-based material, is considered to be safe to human beings  and hence its inclusion as an additive to cell culture medium could be studied further in order to check whether the use of common antibiotics and anti-fungals which may be detrimental to cell growth can be avoided yielding safer anti-bacterial and anti-viral agents for cell culture. Multidisciplinary interaction within and across various domains of science has several potentials in bringing out novel solutions and this has been proven by this study of interaction among physicists, chemists and biologists. 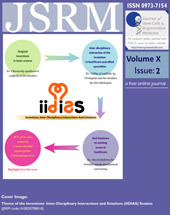 The authors recommend that establishment of barrier-free interaction platforms within and among institutes and various specialties at varied stages of research activities as portrayed here like the IIDIAS session to bring about novel solutions such as the ones described in this article. Sumathipala A, Siribaddana S, Patel V. Under-representation of developing countries in the research literature: ethical issues arising from a survey of five leading medical journals. BMC Med Ethics. 2004;5: E5. Abraham S. The "Electric Biology" Duo. Trade Secrets- Nature Biotechnology Blog 2011. Full text can be accessed at http://blogs.nature.com/tradesecrets/2011/12/06/the-electric-biology-duo. Kubota S, Matsuzawa K, Wada M, Yamaji N. Bactericidal Effect of a Disinfectant (Bio Io Nurse) Prepared by Adding Citric Acid and Low Concentration Alcohol to Strongly Acidic Electrolyzed Water. New Food Industry 2008; 50:9. Dedeepiya VD, William JB, Parthiban JKBC, Yoshioka H, Mori Y, Kuroda S, Iwasaki M, Preethy S, Abraham SJK. Scaffolds for Cell Transplantation in Neurology: The Suitability of a Thermoreversible Gelation Polymer—Our Perspectives. Journal of Spinal Surgery 2014;1(1). Sitalakshmi G, Sudha B, Madhavan HN, Vinay S, Krishnakumar S, Mori Y, Yoshioka H, Abraham S. Ex Vivo Cultivation of Corneal Limbal Epithelial Cells in a Thermoreversible Polymer (Mebiol Gel) and Their Transplantation in Rabbits: An Animal Model. Tissue Eng Part A. 2009;15(2):407-15. Yasuda A, Kojima K, Tinsley KW, Yoshioka H, Mori Y, Vacanti CA. In vitro culture of chondrocytes in a novel thermoreversible gelation polymer scaffold containing growth factors. Tissue Eng. 2006;12(5):1237-45. Kataoka K, Huh N. Application of a Thermo-Reversible Gelation Polymer, Mebiol Gel, for Stem Cell Culture and Regenerative Medicine. J Stem Cells Regen Med. 2010 ;6(1); 10-14. Parveen N, Khan AA, Baskar S, Habeeb MA, Babu R, Abraham S, Yoshioka H, Mori Y, Mohammed HC. Intraperitoneal Transplantation of Hepatocytes Embedded in Thermoreversible Gelation Polymer (Mebiol Gel) in Acute Liver Failure Rat Model. Hepatitis Monthly 2008; 8(4): 275-280. William BJ, Prabakaran R, Ayyappan S, Puskhinraj H, Rao D, Manjunath S, Thamaraikannan P, Dedeepiya VD, Kuroda S, Yoshioka H, Mori Y, Preethy, Abraham S. Functional Recovery of Spinal Cord Injury Following Application of Intralesional Bone Marrow Mononuclear Cells Embedded in Polymer Scaffold - Two Year Follow-up in a Canine. J Stem Cell Res Ther.2011; 1:110. Rao SK, Sudhakar J, Parikumar P, Natarajan S, Insaan A, Yoshioka H, Mori Y, Tsukahara S, Baskar S, Manjunath SR, Senthilkumar R, Thamaraikannan P, Srinivasan T, Preethy S, Abraham SJ. Successful transportation of human corneal endothelial tissues without cool preservation in varying Indian tropical climatic conditions and in vitro cell expansion using a novel polymer. Indian J Ophthalmol. 2014;62(2):130-5. Shimizu S, Yamazaki M, Kubota S, Ozasa T, Moriya H, Kobayashi K, Mikami M, Mori Y, Yamaguchi S. In vitro studies on a new method for islet microencapsulation using a thermoreversible gelation polymer, N-isopropylacrylamide-based copolymer. Artif Organs. 1996;20(11):1232-7. Yoshioka H, Mori Y, Kubota S. Wound dressing of newly developed thermogelling thermoreversible hydrogel. Jpn J Artif Organs. 1998; 27: 503-506. Arumugam S, Manjunath S , Senthilkumar R, Srinivasan V, Rajendiran S, Yoshioka H, Mori Y, Abraham S. In vitro expansion and characterization of human chondrocytes using a novel Thermoreversible Gelation Polymer (TGP). Journal of orthopaedics. 2011; 8(3); 1-10. Hishikawa K, Miura S, Marumo T, Yoshioka H, Mori Y, Takato T, Fujita T. Gene expression profile of human mesenchymal stem cells during osteogenesis in three-dimensional thermoreversible gelation polymer. Biochem Biophys Res Commun. 2004;317(4):1103-7. Lei Y, Schaffer DV. A fully defined and scalable 3D culture system for human pluripotent stem cell expansion and differentiation. Proc Natl Acad Sci U S A. 2013;110(52):E5039-48.